When you have a moment to yourself, do you go online for a little retail therapy? As part of the POPSUGAR Insights "Find Your Happy" study, we asked women to tell us what types of content they seek out when they are able to grab a little "me time." 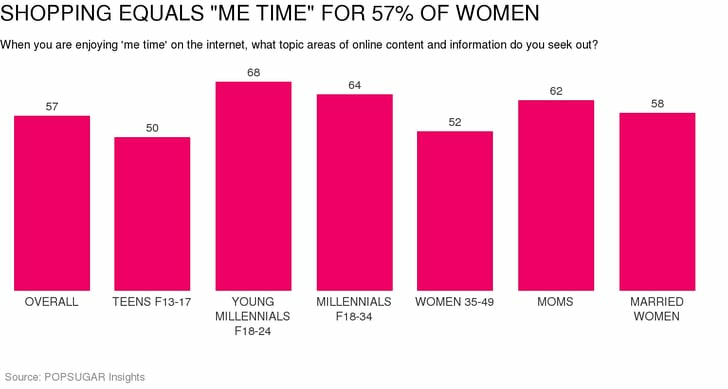 Nearly six in 10 women said that shopping online is how they spend their time. In terms of specific female segments, shopping was preferred by millennials (64%), especially younger millennials between the ages of 18-24 (68%), and by moms (62%). After shopping, many lifestyle content categories ranked highly, including food or cooking content (46%), fashion content (43%), and entertainment news and information (41%). Teen girls are more likely than women overall to seek out fashion content (50%) and gaming information (66%), while millennial women (18-34) enjoy entertainment content (60%) and read cooking content (50.6%).